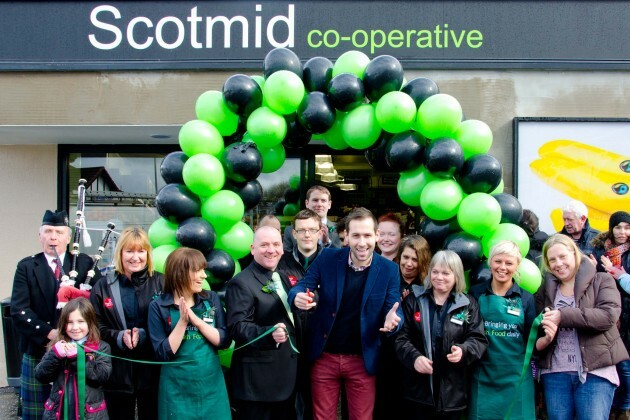 Clyde 1 DJ Romeo opened the new and improved Scotmid in Clarkston on 15 March 2013, after the store underwent a complete refit to offer customers a greater range of choice and new services. The first 50 customers received goody bags in the official re-launch, with a piper on hand to entertain the queue waiting to see their new local store. Scotmid Clarkston shoppers will benefit from a new in-store bakery, artisan breads, a freshly squeezed orange juice maker, more fresh fruit and vegetables and extended opening hours. The store will also stock more products from local suppliers as part of Scotmid’s commitment to supporting Scottish farmers and producers. Other improvements include a larger chilled section, fresh ground coffee and an extended range of wine and craft beers. New healthy recipe cards and wine tasting notes for customers are also new features in the store. The store’s carpark has been redesigned to accommodate more cars, while the appearance of the store has been given a facelift to improve the shopping environment for customers.